Health Costs > How Much Do Vitamins Cost? How Much Do Vitamins Cost? On the “Today” show with Katie Couric, Dr. Andrew Weil spoke regarding the use of vitamins. He explained that he personally uses vitamins for two reasons: First, as an “insurance against gaps in my diet”, and second because some vitamins and minerals can be “protective against disease in amounts that may be difficult to obtain through diet alone.” Although all the vitamins and minerals can be ideally obtained through our diet, we realistically don’t always eat the things we should in the correct amounts on a daily basis. For this reason, most doctors suggest either specific vitamins or some type of multivitamin for people of all ages. In order to see what type of vitamins you need to take specifically, ask your doctor or use a service such as vitaminid.com. This website allows you to fill out a questionnaire about your diet and family history to determine what, if any, vitamins you should be taking. A basic multivitamin should be taken once daily. A multivitamin, such as Centrum Complete, can be found for about $.06-$.15 per vitamin. For example, Meijer sells this particular brand for $12.99 for 180 vitamins. Centrum also provides age- and gender-specific vitamins for a slightly higher cost. This means that a multivitamin will only cost between $20 and $50 per year depending on the brand you choose. Specific vitamins, such as Vitamin C, Vitamin D, and Zinc will cost $.06-$.10 per capsule. These are also taken once a day, so if they are to be taken in addition to a daily multivitamin, this will add about $20-$35 per year to your vitamin cost. Niche-based vitamins, such as a hair growth vitamin, can cost anywhere from $14 to $50 per bottle. This will greatly depend on the brand. Vitamins designed for the hair, skin and nails can cost anywhere from $6 to $20 for bottles that can contain up to 120 tablets. If you choose a brand of multivitamin, such as Nature Made, you may pay a little extra for the all-natural supplements and herbs with which they are made. It’s always best to get your vitamins directly from food. Use vitamins as your last resort or as a supplement. Always try to take your vitamins after you eat your food as it can cause discomfort without eating any food. If confused about taking any type of vitamins, consult with a doctor to learn more about what vitamins can do for you. 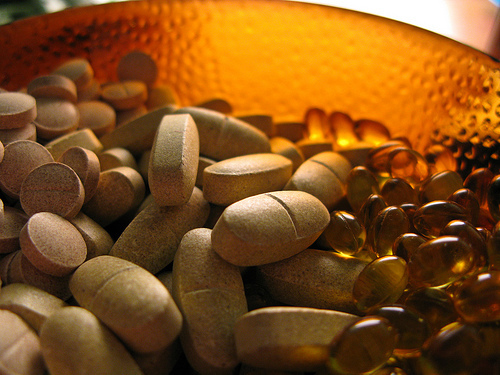 50 percent of Americans take multivitamins. In 2015, Americans spent close to $21 billion on supplements. That is nine cents for every adult. Many long-term studies have failed to come up with any evidence that suggests taking a multivitamin. Stores, such as Costco, sell vitamins in much larger quantities for as little as $.02-$.05 per vitamin. Most brands have coupons available for download from their websites. Doctors can often hand out vitamin packs for free if requested. For example, if you’re visiting the OB/GYN, most have closet filled with samples that can be handed out for free during a checkup. I recently bought a bottle of Centrum Vitamins -200 ct for $7.64 at Walmart. That comes out to .03 per vitamin -so yes that’s def. worth it!